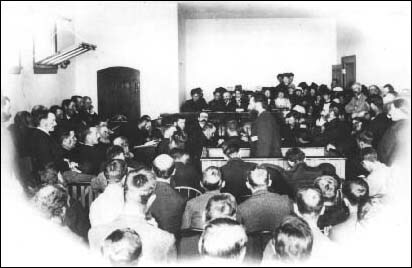 A side view of Louis Riel addressing the jury at his trial in Regina, Saskatchewan. Stockists: Kim Morrissey's books can be ordered directly from Coteau Books or can be ordered through any good bookstore. This is a free educational resource site. If you would like to use any part of this study package, please e-mail Coteau Books, who will be happy to give you permission. PLEASE NOTE: This site is an educational resource only. No part of the poem may be reproduced in any form or by any means without permission, except by a student (or reviewer), who may quote brief passages in an essay (or review). Click Here for a copy of the Battle of Batoche print. This site maintained through the generous support of CENLYT Productions-ms designs.